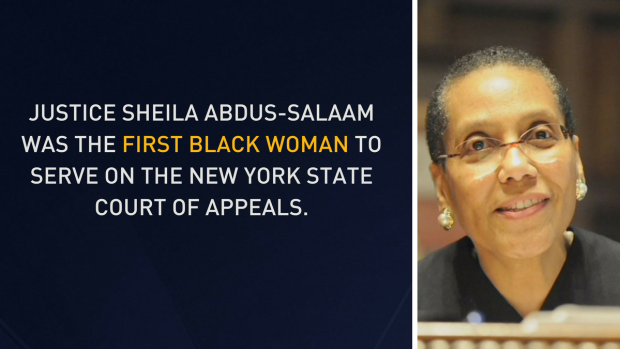 Sheila Abdus-Salaam was a legal pioneer: the first black woman to be appointed to New York state's highest court and the first Muslim woman to serve as a judge in the U.S. The body of the first black woman appointed to New York state's highest court was found in the Hudson River off Manhattan on Wednesday afternoon, police said. Ray Villeda reports. As tributes continue to pour in honoring the late Justice Sheila Abdus-Salaam, the pioneering black Muslim judge who rose from humble beginnings in a family of seven children to a trailblazing appointment on New York state's highest court, investigators are beginning to reveal a timeline of her last days. Abdus-Salaam, the first black woman appointed to New York state's highest court and the first Muslim woman to serve as a U.S. judge, was found dead in the Hudson River off Manhattan Wednesday afternoon, a day after she was reported missing, authorities said. After an unrelated news briefing Thursday, Robert Boyce, the NYPD's chief of detectives, said her body showed no obvious signs of trauma and though there was no early indication of criminality, the investigation is ongoing. Boyce said Abdus-Salaam spent the weekend with her husband in New Jersey; the husband last saw her Sunday night around 7 p.m. According to Boyce, Abdus-Salaam spoke with her assistant Tuesday morning; that appears to be the last time anyone heard from her before her body was found near West 132nd Street and Henry Hudson Parkway roughly 30 hours later. Boyce said investigators are focusing on what happened in the hours after she spoke to her assistant; they're also looking for any video that may lend insight to the probe. Police say Abdus-Salaam had her MetroCard on her when her body was pulled from the water; it had last been used at 42nd Street on Monday. Though there were no apparent signs of trauma, investigators don't know how long she was in the water, Boyce said, which could an impact. A medical examiner is conducting an autopsy to determine how she died. Calling Abdus-Salaam's death a surprise to everyone, Boyce said investigators have a long way to go. Shortly before Boyce briefed reporters on the investigation, NYPD Commissioner James O'Neill joined the chorus of those mourning the death of the 65-year-old Manhattan resident. Abdus-Salaam was elected to the Supreme Court of the State of New York in 1993, where she remained until 2009. She was serving on the New York State Court of Appeals, the highest court in New York State, before her death. She was appointed to the position by Gov. Cuomo in 2013. In a statement Wednesday, Cuomo called Abdus-Salaam a "pioneer" and a "force for good whose legacy will be felt for years to come." Others recalled Abdus-Salaam as an inspiration to all who had the good fortune to know her. Chief Judge Janet DiFiore recalled her "personal warmth, uncompromising sense of fairness and bright legal mind." A Washington, D.C., native, Abdus-Salaam graduated from Barnard College with a degree in economics in 1974 and went on to receive her law degree from Columbia University in 1977 as a Charles Evans Hughes Fellow. The president of the New York State Bar Association, Claire Gutekunst, said Abdus-Salaam grew up poor in a family of seven children and "rose to become one of the seven judges in New York's highest court, where her intellect, judicial temperament and wisdom earned her wide respect." On her block of West 131st Street, Abdus-Salaam was part of a nonprofit called Project Brownstone, which helps under-served youth. "She was amazing because she really inspired the kids," Project Brownstone Founder Earl Davis said. "She was able to show them something that was outside of their realm." To those who knew her on a personal level outside the courthouse, it's that spirit they will miss the most. "It's shocking," Davis said. "I just don't understand what happened."